Cedar Creek Falls (Devil's Punch Bowl) is an extremely popular hike, and for very good reason. The hike itself offers breathtaking views of the San Diego River Gorge and surrounding mountains, and the destination is an idyllic swimming hole at the base of an 80 foot waterfall. You can get to the Eagle Peak Road trailhead by Driving along Highway 78, 1 mile west of Julian turn south onto Pine Hills Road. Follow Pine Hills Road for 1.5 miles, bear right onto Eagle Peak Road. Follow Eagle Peak Road for 9.4 miles of progressively poorer dirt road until you come to the Cedar Creek Falls Trail Head. A popular hike in San Diego County, the trail to Cedar Creek Falls is a challenging pathway through backcountry hills and down an exposed canyon to a spectacular waterfall. 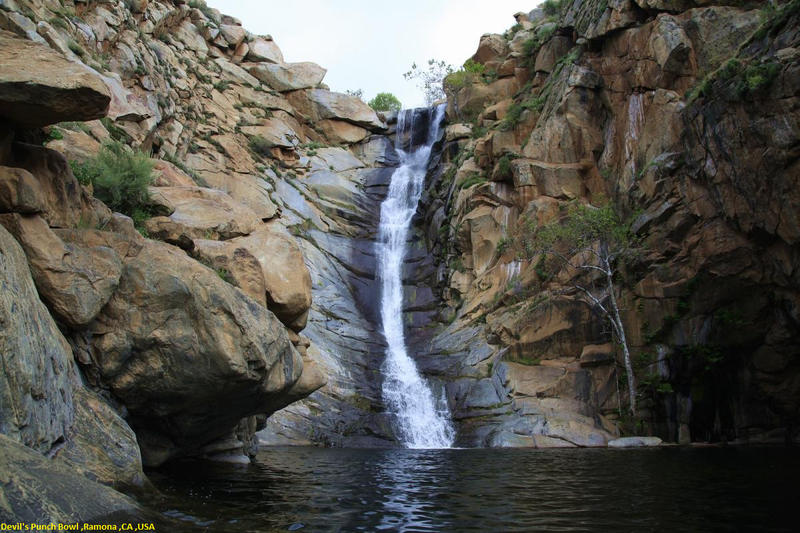 Based in eastern San Diego in Cleveland Nationa Forest, Cedar Creek Waterfall can be accessed from the main trailhead at San Diego River Gorge starting in Ramona or via Saddleback Trailhead at the end of Eagle Peak Road in Julian. Please know that a visitor use permit is required to hike from the bottom of the Canyon to the Falls and only 75 permits are allocated per day. One permit can have up to 5 people on it. This hike is not advised for those with health conditions and not recommended in summer months due to extreme heat and the risk of heat stroke. Bring at least one gallon of water per person in summer months. Climbing on and jumping off the cliffs surrounding the waterfall is prohibited.